WASHINGTON CITY — Desert Hills High School’s girls and boys swim teams each took first place at the Region 9 championships, with Cedar High taking second in both girls and boys categories. The meet took place Friday and Saturday at the Washington City Community Center, with Desert Hills serving as the host team. Desert Hills won the meet’s first race Friday evening, with the Lady Thunder winning the 200-yard medley relay in time of 1:53.11, while second-place Cedar finished the race in 1:58.13. The very last race of the day Saturday ended in similar fashion, with the Desert Hills boys winning the 400-yard freestyle relay in a time of 3:16.93, more than 15 seconds ahead of runner-up Cedar, which posted a time of 3:32.08. The Thunder foursome of Trevor Larson, Noah Ashton, Keegan Wawrzyniak and Payton Plumb broke their team’s own 4A season-best time by more than five seconds. Caldwell said swimmers share a camaraderie that goes beyond their teammates and extends to rival competitors. “It’s like a common bond of experience we share,” she said, thanking the other region coaches for their ongoing support. Desert Hills ended up winning all six relays over the two-day meet. Cedar finished second in five of those events, while Snow Canyon girls picked up the second-place spot in the 400-yard freestyle relay. 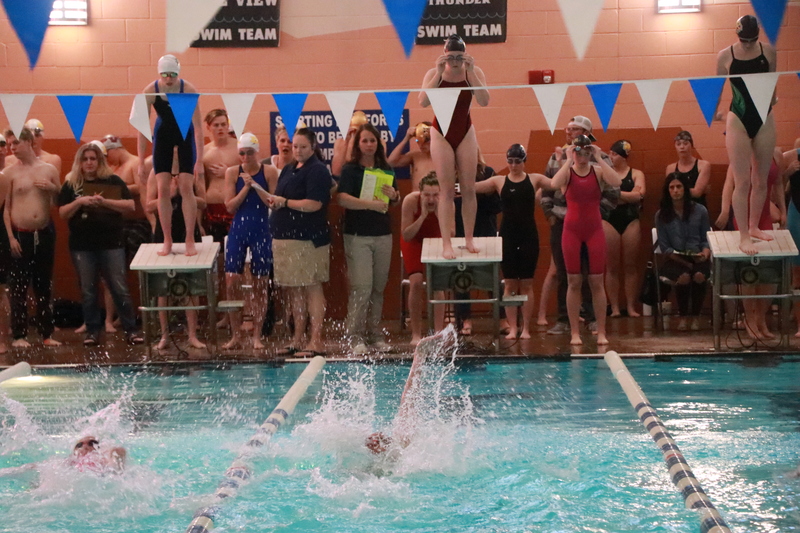 Individually, five different swimmers (two female and three male) took first place in both of their individual events. Desert Hills junior Sarah Hansen won both the 200-yard individual medley and the 100-yard breaststroke. She set new personal bests in both events, posting a time of 2:12.86 in the individual medley and a time of 1:09.48 in the breaststroke. The other two-time region champion for the girls was junior sprinter Mya Ottenschot of Desert Hills, who won both the 50-yard and 100-yard freestyle races, barely edging Cedar senior Aspen Bonzo in both events. In the 50 free, Ottenschot’s winning time was 25.24 seconds, while runner-up Bonzo finished in 25.43 seconds. In the 100 free, Ottenschot won in 55.49 and Bonzo took second with a time of 55.84. In the boys category, Desert Hills had two athletes take first place in region in both of their individual events. 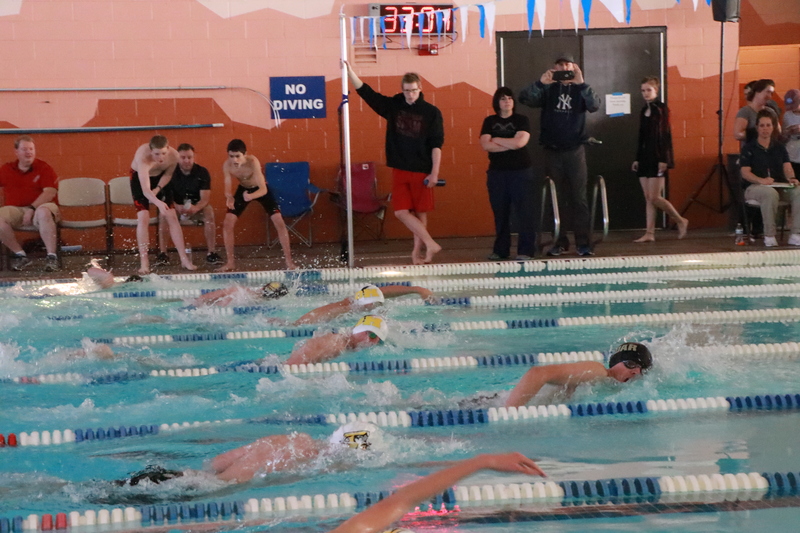 Junior Keegan Wawrzyniak won both the 50-yard freestyle and 100-yard freestyle races, narrowly edging senior teammate Noah Ashton in both races. Wawrzyniak’s time in the 50 free was 22.23 seconds, while Ashton finished in 22.34. In the 100 free, Wawrzyniak had a time of 48.65, while Ashton clocked a 49.10. All four times were personal bests. The other Desert Hills boy to win two individual events at region was sophomore Payton Plumb, who won the 200-yard individual medley in a time of 1:56.81 and the 100-yard backstroke in a time of 51.65 seconds. Hurricane junior Ryan Bunn also won both of his individual events at region. 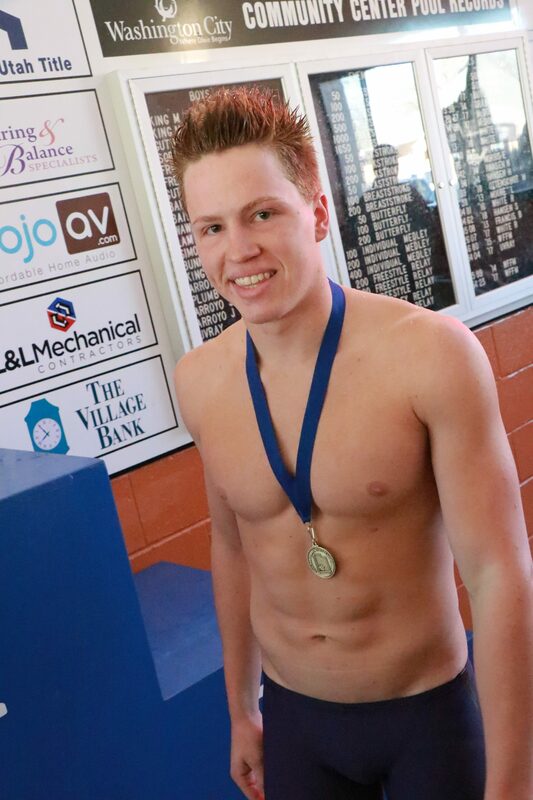 Bunn posted a convincing victory in the 100-yard butterfly with a personal-best time of 52.94 seconds. He also won the 200-yard freestyle in a time of 1:45.48, also a personal record. Other standout performances included Snow Canyon freshman Cambria Callaway’s win in the girls 500-yard freestyle. In a thrilling race that went down to the wire, Callaway’s time of 5:21.63 was just under a half-second faster than that of Desert Hills junior Taylor Porter, who finished second with a time of 5:22.17. Callaway also placed fourth in the 200 IM event. 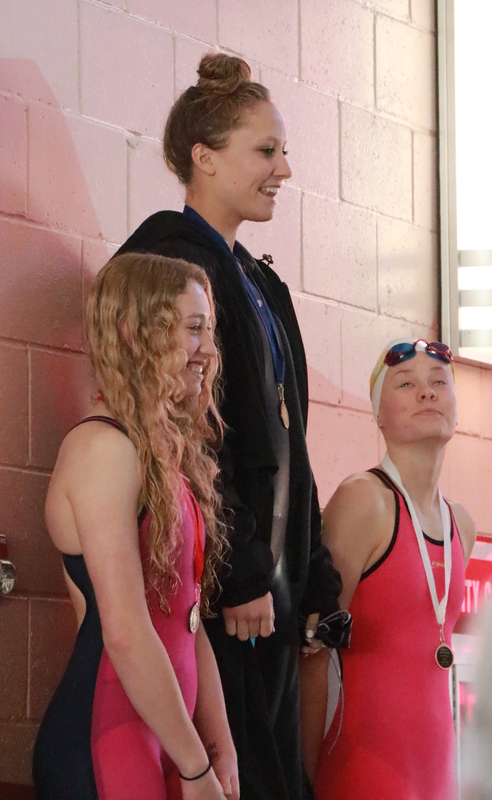 Cedar sophomore Elisa Price won the girls 100-yard backstroke with a time of 57.81, just 0.16 seconds ahead of runner-up Caitlin Romprey of Desert Hills. Price also took second in the 100-yard butterfly, while Romprey, a freshman, also placed third in the 100 free. Junior Trinity Schimbeck of Desert Hills won the 200-yard freestyle in a personal-best time of 1:59.17. Teammate Porter placed second in that same event. Schimbeck also placed third in the 500 free. Snow Canyon sophomore Stephanie Dansie won the 100-yard butterfly in a time of 1:00.78, narrowly beating runner-up Elisa Price of Cedar, who posted a time of 1:01.00. Both marks were respective personal bests. For the Region 9 boys, other noteworthy performances included Cedar junior Wyatt Kjar’s victory in the 500-yard freestyle. His winning time of 5:05.43 was a personal best by more than seven seconds. In addition, Cedar High senior Garrett Dotson took first place in the 100-yard breaststroke with a time of 59.85 seconds, a personal best and the fastest time among 4A boys this season. Dotson also placed second to Plumb in the 200 IM, finishing in 2:03.04, also a personal best. The next and final event of the high school swim season is the UHSAA state 4A meet, which is scheduled for Feb. 9-10 at the South Davis Recreation Center in Bountiful. Coaches have until Jan. 30 to submit their team’s state entries.